While other revelers pack into crowded bars and restaurants on December 31, your group can ring in the new year aboard a luxurious private yacht! Other cruises will host upwards of 600 people on this night, but Viator’s VIP New Year’s Eve cruise limits this experience to just 200 adults who want to celebrate in style and comfort. Throughout the evening, enjoy hors d’oeuvres, a fine dining experience, an open bar, live DJ entertainment and stunning views of the New York City skyline. It's a great escape from the Times Square hustle-bustle. Book now to reserve your spot on the VIP New Year’s Eve cruise; tickets go fast! Your VIP experience begins at Chelsea Piers in Manhattan, where you’ll board the 160-foot (48.8-meter) Atlantica, one of New York City’s most elegant private yachts. From there, cruise out to the Hudson River for an evening of cocktails, dinner, dancing and fireworks. It's a great way to ring in the new year in the Big Apple, and avoid the Times Square crowds! Start the night off with hors d’oeuvres and premium cocktails from the open bar. Since this cruise is limited to 200 people, you can expect short wait lines and premium service as you order your beverages. Pluck tasty appetizers from passing trays, and chat with friends and family in the warmth of the cabin. Settle in a shared table for a delicious dinner buffet as the DJ spins a mix of festive songs during the 4-hour cruise; feel free to hit the dance floor whenever the mood strikes. 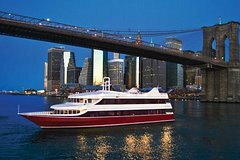 For stellar views, head to the open-air deck to admire the city skyline as you cruise around the tip of Manhattan, up the East River, and under the world-famous Brooklyn Bridge. Pass famous landmarks including the Statue of Liberty, the World Financial Center and the shimmering art deco spires of the Empire State Building and the Chrysler Building. Look north to catch a glimpse of the sleek United Nations building. Go back in and sit down for more views of the twinkling city over a fine dining experience. Located in a spacious dining room, elegant decor and exceptional service. See the Itinerary below for a menu that includes seasonal, fresh ingredients. After you finish dessert, cut loose on two dance floors with DJ entertainment! Expect everything from classic party songs to Top 40 hits to get you moving, and ballads to pull your date in for a slow dance. As the clock strikes midnight, admire unbeatable views of the fireworks shimmering above the Statue of Liberty from the boat’s deck, a picture-perfect end to your unforgettable New Year’s Eve experience.